When I was a kid growing up in the 1980s and ’90s, in addition to having big hair, I made my own lunch. Part of making my own lunch was factoring in the fact that I went to an after-school program, and so I packed a snack—and not because my parents told me to. I just did it. That snack usually consisted of something healthy and simple. I distinctly remember another after-schooler wising me to the yummy, gumminess of string cheese and the knowledge that if I packed an extra half sandwich or an apple, I would be good until my mom’s station wagon pulled up to the YMCA around five o’clock. Never did I hear my belly rumble like a summer thunderstorm approaching. Never did my knees weaken from hypoglycemia. Never did I feel undernourished. Flash forward to modern day. Now I am a mom, and I have three daughters ages eight, seven and five. They do not pack their lunches, and they do not typically go to after-school childcare. Parenting is much different these days, and I, like many parents, question if we are teaching our children the same life skills—like self-sufficiency, responsibility and enterprise—that our parents instilled in us. And though there has been a lot of press about helicopter parenting and as of late the “affluenza” teen, what I really want to take a bite out of today is a not-so-tasty bi-product of the current parental climate: snacking, or rather over-snacking. The mom looked at me as if I had committed a mommy faux pas, handed her child another animal cracker, and walking lunged away from me in apparent disgust. It was during this “mom”-ment that I was reminded of other senseless baby trends like the diaper wipes warmer, and I made a decision to never feed into the snack-a-thon. I knew I was not crazy or DSS-calling worthy for not shoveling nutrition and flavor-deplete food down my kid’s throat. And I hoped with the hopefulness of a child that there were other parents like me who drew a line in the sandbox when it came to being a mom (or dad) and a mom-zilla (or dad-zilla). And yet, over the past near decade of being a mom, I have only seen the snack craze get crazier. Schools have so many food times that my kids’ lunches look more like a pediatric dim sum plate than an actual lunch. Many of their sports teams and extracurricular activities require a “snack fee,” which really means health-conscious parents like me are forced to pay money for their children to eat food they would never dream of purchasing like hot pink Keebler sugar wafers and Doritos—which, last time I checked, were not filling snacks but rather artificial food bombs. 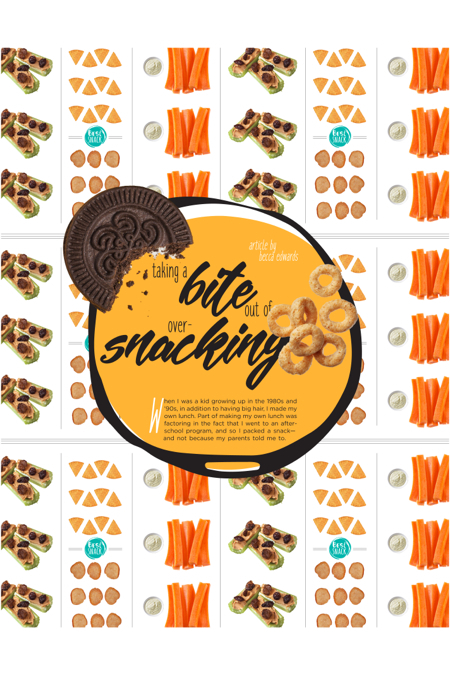 And while planning playdates and birthday parties, there is always “the snack talk” in which we discuss who is allergic to what (which, granted, is a valuable conversation) and who is bringing what to the smorgasbord of snackables. One mom told me that if my daughter wanted to have a playdate, she would need to bring her own snack. When I told her we don’t really snack she said, “Well, pack a snack anyway.” Mind you, it was not like the playdate was some caloric burning get-together. The girls played Barbie for two hours. Do you remember as kids when our parents would tell us to wait 30 minutes before we could swim? It was just this thing our parents felt obligated to say. No one wanted to be the parent that said, “Wait a minute, what really would happen if Susie went swimming five or ten minutes after eating?” Well, I propose to you, dear reader, that’s what this whole snacking thing is all about. Maybe parents just feel obliged to Oreos and Goldfish? I am not suggesting we starve our children, but what if we simply fed them more nutrient dense, meal-like meals and maybe just the occasional snack? Whole, kid-friendly foods such as raw sugar snap peas, carrots, and sweet mini peppers (dipped in hummus nonetheless) are packed with antioxidants and vitamins and proven to provide sustained satiety. However, sugary, refined or processed foods tend to create a sugar spike, often leading to hyperactivity followed by a dip in performance and—get this—hunger. The Mayo Clinic Diet focuses on the concept of energy density. “The goal is to eat low-energy-dense foods. That is, you want to eat a greater volume of food that’s lower in calories. This helps you feel fuller on fewer calories.” Mayo wrote, “Here’s a quick example with raisins and grapes. Raisins have a high energy density—1 cup of raisins has about 434 calories. Grapes have a low energy density—1 cup of grapes has about 82 calories.” According to this plan, the key ingredients to energy density are water, fiber and fat. Fruits and vegetables are generally high in water content, which provides volume and weight but not calories. That’s why they are low-energy-dense foods. High-fiber foods like vegetables, fruits and whole grains not only provide volume, but also take longer to digest, making you feel full longer on fewer calories. And though healthy fats like almonds and avocados portioned reasonably (e.g., one small handful of nuts and one fourth of an avocado) can stabilize blood sugar and provide satiety, high fat foods such as the notorious Lunchables are high in energy density (as well as sodium) and are often blamed for our nation’s increase in childhood obesity and diabetes. STOP THE PRESSES! It’s Newsies at the Arts Center!